When Jim Willie talks, I listen. He is one of the best statisticians that I know who comments on finance and economy. His accuracy is phenomenal, and his news is horrendous. Jim Willie is an American who operates out of Costa Rica, and you’ll see his website, goldenjackass.com, on my blogroll lower down the page. He has a paid subscription service where he publishes analysis and forecasts every two weeks. He charges $110 for a six month subscription, and it looks like it’s worth every penny. This is the end of dollar-based trade. This is the end of the dollar reserve currency role. This is the end of Treasury bonds in banking systems as reserve foundation. The end of the petrodollar. We’re at crossroads here, folks, where… extremely dangerous… the vile corrupt bankers will not go quietly into the night. This is The End Of The World As We Know It – TEOTWAWKI. This is financial devastation, and the end of American hegemony in the world. This is also the harbinger of global war, because ‘the vile corrupt bankers will not go quietly into the night’. You MUST get ready for this! The only problem that I have with Jim is the quality of his voice and his sense of humor. Really, that’s it. Do NOT let the reedy, nasal intonation (and the terrible jokes that he tells) keep you from listening to what he has to say. And there’s been kind of a joke in the last five years that since the United States government doesn’t have an gold reserves… Fort Knox is empty… The joke is that the US Dollar is backed by the Military Might [of the US]. We’re starting to see that evident in a very painful and extraordinarily dangerous way right now with Syria. The Syria mess has the risk of turning into a very serious war. The United States needs wars. They need wars to take away rights, to firm up banker power, to distract the world into thinking that their security is at stake. The ones doing the attacking are largely the US security agencies. That’s evident right now in Syria. The whole ‘Arab Spring Movement’ has destabilized all of North Africa. And, it’s going to eventually have a very detrimental effect financially with working to topple the Saudi regime. And, that’s the home, the center, the core, of the Petrodollar. The Syrian mess right now… the battles going on… are to prevent a pipeline from hitting the port and finishing construction from Iran, through NorthEast Iraq, into Syria and to the Mediterrainean port. The big issue for the United States right now, is that they want to prevent Europe from being dependant… or, even a customer… of Iranian natural gas. They want to prevent western Europe from being a captive of Gazprom and its… just EXTENSIVE… pipelines into Asia, into Southwest Asia, into Eastern Europe, into Western Europe, and Gazprom even extends into Great Britain. I believe that a phone call was made last week between the Gazprom officials who have offices in the Kremlin in Russia, Moscow… Gazprom called Cameron in London and told them to not back the United States in Syria. This is getting very, very serious. And, you know, an interesting parallel is that for five years the United States, through the central bank, The Federal Reserve, has had no exit policy, no exit strategy, no exit opportunity, from zero percent… which back in ’09 I said would remain remain forever and that has turned out to be a correct forecast. But, then in 2010, when they were talking about Quantitative Easing and bond purchases, I made another forecast and said that QE would go on forever. It wouldn’t be temporary. It would be forever because there would be very few buyers of US Treasury debt. Now we see the ‘zero percent’ permanent. We see the bond purchasing through monetization, permanent. And the US has no way to get out of this. So, the parallel is that the Fed is stuck with zero percent and QE. And, the military is now stuck. They’re damned if they do – they’re damned if they don’t – regarding Syria. We’re losing credibility and the United States is gradually being isolated. This is all turns into a gold play, though. Because, what’s in progress, in my opinion, through Syria is the death of the dollar. The US military is seeing a last opportunity… actually it’s the Wallstreet bankers, using their military arm… as a last ditch defense of the petrodollar. Because the Gazprom natural gas pipeline and the co-op… I call it the NatGas Co-Op. It has some strange bedfellows in it – Like Turkministan, Israel, Qatar, Iran… These are very strange bedfellows. They’re all working with Gazprom of Russia. What’s coming online soon is the eclipse of OPEC and the fading away of Saudi power. And, the alignment will disappear between the Saudis and the United States. The petrodollar is going to fade away. Natural gas is going to take over in importance on a geopolitical basis. And, that I believe is going to foster some tremendous shockwaves in the financial world where treasury bonds are going to be divested – converted to gold. We’re very close to the point where the dollar is going to lose its petro… petrodollar foundation, its platform, the basis of global trade, or predominant global trade, but definitely most of crude oil trade. The great majority of crude oil trade. We’re going to be moving toward a different system, where a lot of different countries… and it’s going to approach a critical mass very quickly… are not going to trade in the dollar… they’re not going to settle trade in the dollar. This is how gold will get to three thousand, and make quick moves to five and seven thousand. 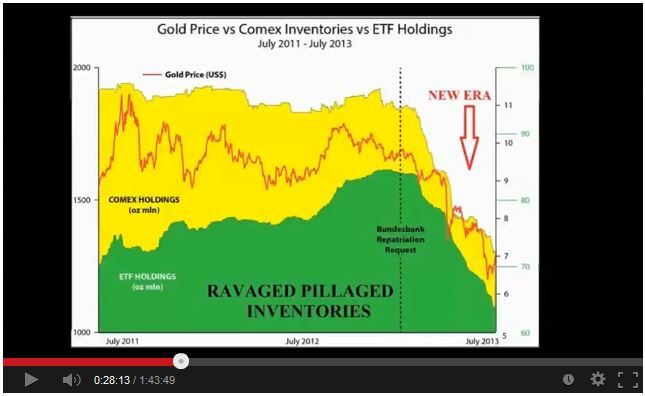 The graph that I have here [Gold Price vs Comex Holdings vs ETF Holdings] shows in vivid form how the Comex inventories and ETF holdings are all being drained. And, it points out that the German repatriation request was a primary event. That was late last year. About December or November. I don’t have the exact date, but it was eight or nine or ten months ago. Everything changed after that. I won’t get into things like the Mali war to provide supply [of gold] for Germany, England and France. That’s the kind of stuff where it proves my point that monetary policy is being mixed with military policy. London was so desperate for gold that they saw fit to attack Libya and the embassy, so that Qaddafy being dead could not go to London to claim his 144 tons [of gold], which London needed more than Qaddafy did. So the mix of monetary policy and military policy is becoming quite ugly-evident now, and we see the Comex inventories being drained. We’re getting really close… I don’t have any idea when… it could be months… it could be several months… could be a year… but I think that it’s going to be more like several months… the Comex is going to stop offering gold futures contracts and will no longer be in the business of Gold price discovery. In other words the price will be set elsewhere. I think we’re going to have a dark period, but shortly after … like 30 to 60 days after… it’ll be quite clear what the gold price is because you’ll have five, six, eight different centers around the world that are gold trades… where gold is trading avidly and they’re all going to kind of put forward their best price and it’ll all be averaged. And, you’re going to get some kind of Libor type of average. Libor is an average of various prices. They drop the lowest and drop the highest, or something like that, and average the rest. Kind of like an Olympic gymnastic competition judging. That’s what LIBOR is like. We’re going to see the same thing in gold in the next year or two, and when we do, it’s not going to be under two thousand. So, Peter, that’s my spiel of what’s going on with Syria, and how it relates to the dollar, the petrodollar, the gold trade settlement. The natural gas pipelines are not going to settle in dollars. That’s why the US government is trying to block the advance of the ports for the gas pipelines in Syria. This is the end of dollar-based trade. This is the end of gold… I’m sorry… The end of the dollar reserve currency role. This is the end of Treasury bonds in banking systems as reserve foundation. The end of the petrodollar. We’re at crossroads here, folks, where… extremely dangerous… the vile corrupt bankers will not go quietly into the night.